The BeoVision Horizon might count as a budget television for B&O, but it still retains a formidable price tag that isn't quite backed up by the technology inside it, despite looking greate on the outside. We were initially surprised when Bang and Olufsen decided to announce its new BeoVision Horizon television at IFA 2016. After all, it's only been just over a month since the company announced its flagship 4K television, the BeoVision 14. But the truth is that the BeoVision Horizon is Bang and Olufsen's mid-range 4K television, rather than an upscale usurper out to dethrone the BeoVision 14. What that means is that the Horizon's sound system isn't quite as as fully-featured as the 14; or have the same premium glass construction; and its room sensing technology is much more limited. Despite these budget limitations, the Horizon still retains much of the appeal of its larger brother in terms of its styling. The bottom part of its frame is dedicated to a large speaker grill, which is lined with the same great-looking wooden slats found on the rest of the BeoVision line. It's nice to see that despite its middle-of-the-road target no corners were cut here when it comes to materials. The speakers themselves have seen a little bit of a downgrade, though, and feature just two full-range 2.5" speakers as opposed to the BeoVision 14's three-way speaker solution. It's unfortunate that the speaker takes up such a large part of the screen despite not being as fully featured as the one on the BeoVision 14. Worse, supposed you don't like the pack-in speaker, its size means that another soundbar would look ridiculous if hung underneath this TV, so if you don't like its audio quality you're out of luck. Leaving the speaker alone for a minute, the biggest aesthetic change comes from the frame at the top of the television which is of a plastic construction rather than the BeoVision 14's glass. This plastic construction really only looks bad when stood side-by-side with its more expensive sibling, and otherwise has a relatively clean, refined look to it. Along the top of the frame you can find the other feature that separates the Horizon from the BeoVision 14: the image sensor. Whereas on the BeoVisian 14 this image sensor took in a 360 degree impression of your lighting conditions, the Horizon only looks at what's in front of the TV, and if you have your TV positioned next to a wall then that's all that you reasonably need. The way the room-sensing technology works is that the light-sensor in the TV will pick up how bright your room is and adjust the brightness level of the TV accordingly. You might notice your phone doing something similar so that it's easier to read in bright conditions. Similar to phones, B&O's aim of including this feature with a TV is to not waste energy blinding people when the screen is being viewed in a dark room and cut back on overall energy costs. In terms of operating system, you'll find the familiar Android TV OS here, which works well considering that the Horizon has full support for Google Cast technology built in. Moving onto picture quality, the BeoVision Horizon has decent 4K performance – though, interesting side note, what we're basing that opinion on are Ultra-HD clips of the television being made that the company chose to show off by self-indulgently playing on the show floor at IFA . The excellent 4K performance is thanks to the fact that the BeoVision Horizon has exactly the same panel as the more expensive BeoVision 14, which means no corners have been cut in this regard to reach its more mid-range price point. Images were crisp and detailed, and we actually preferred the plastic construction of the Horizon over the BeoVision 14 because of its matt finish that didn't reflect the lights on the show floor quite as harshly. The real shame, though, is that HDR didn't make an appearance on the set, which meant that its picture didn't have the same depth to it as the other sets on the show floor. It might have been the footage being shown, but images seemed to have a sepia tinge to them that almost made them feel a little washed out in spite of their crispness. 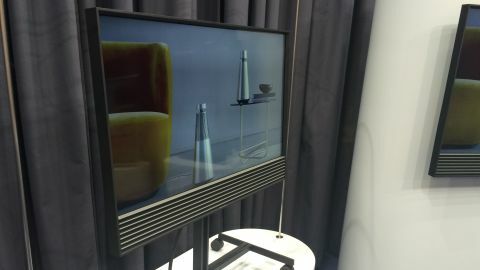 Bang and Olufsen have always made fantastic-looking products and, from our first look at the set, the BeoVision Horizon seems to be no different. In many ways we actually preferred it to the company's current flagship because of the matt rather than gloss finish, although your mileage may vary. The omission of HDR, especially at this price, however, is a bitter pill to swallow, and it remains to be seen whether the slimmed down sound-system will offer a decent level of audio quality in a domestic setting. If you want a TV set that's going to look great in your room while it's turned off then the Horizon is certainly a good model to consider. It's only problem at this price (which we should remember is the same as many other manufacturer's flagship models) is how it performs once you stop admiring it and actually turn it on.